A shocking video has emerged of a circus worker dancing on the back of a dying elephant while it bathes in a river. The film shows Madi - a 48-year-old Indian elephant - slowly drowning as the circus owner's brother jumps around on her in a pair of swimming shorts as she sinks under the surface. 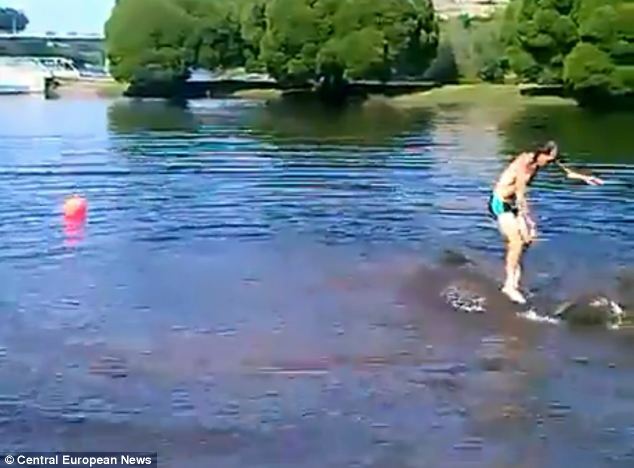 Horrified witnesses made the 40 minute video when Madi - from Germany's Universal Circus Renz - was taken to a river to bath during a tour of Estonia. As Madi - clearly frail and in distressed - stumbles onto her side into the water, the zoo owner's brother Rene Renz leaps onto her back and begins clowning around for spectators. Even when the stricken animal sinks dying under the surface of the water in Narva, Renz leaps from its back in a comic dive for more laughs. What brings someone to such cruelty, such thoughtless action? It is unfathomable. I cannot comprehend it. I can only conclude that this level of cruelty is borne out of a deep and severe madness. There is no other explanation. Whomsoever commits such an act must be insane. The worst is that animal cruelty especially is exceedingly common. Walk into the homes of ten families and it would not be far off to estimate that 8 out of 10 are abusing or neglecting their animals in some way. People don't know how to consider animals, people don't know how to look after animals in the way that is best for the animal - only in the way that is most convenient for the people. How many animals suffer terrible conditions simply because their "caretakers" do know know, and do not care to learn, how to take care of the animal properly. From the tiny fraction of animals on Earth that I have met, almost all of them experienced abuse or neglect simply because their "owners" did what was most convenient for themselves instead of what was best for the animal. Have you ever lived with flea infestations, or skin conditions like mange? These are common ailments that should not be common - they are easily prevented and treated. Any owner who pleads ignorance and is not willing to educate themselves should be banned from keeping animals. How advanced and enlightened we are. Really? Our true nature is revealed in our worst actions, in the way we treat those we consider to be inferior to ourselves.